Beautifully engraved Specimen Dormitory Mortgage Bond Certificate from Pacific Lutheran College dated 1953. This historic document was printed by American Bank Note Company and has an ornate border around it with a vignette of a man in front of a city. This item is over 58 years old. 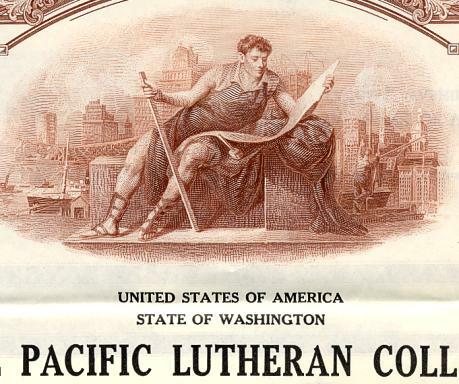 Founded in 1890 by Scandinavian, mostly Norwegian, immigrants to further Lutheran higher education in the Pacific Northwest, PLU is an institution of the Evangelical Lutheran Church in America. The school merged with Everett's Columbia College in 1920, became a two-year school, and resumed operations as Pacific Lutheran College. Spokane College merged with Pacific Lutheran College nine years later. PLC resumed awarding four-year degrees in 1939. 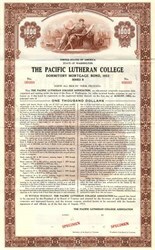 Pacific Lutheran gained university status in 1960. PLU retains strong ties with its Scandinavian heritage, having been visited multiple times by Norwegian and Swedish monarchs and the Norwegian Parliament, Stortinget.